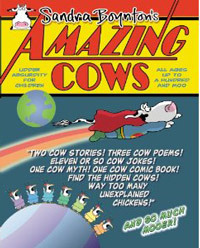 Is there a cow in your wallet? At the time all the new American state quarters were designed over 10 years ago, each state’s residents got to pick what would best represent their own state. I remember living in California and going on a specific website to make my pick (which didn’t get picked, by the way). So my question is, why would anyone want their state to be represented by a dead cow’s skull ? If this was Arizona with its dreadful deserts, I’d understand. But big sky country Montana? I know they raise a lot of cattle there, so are they trying to tell us something about the welfare of those herds? You know me, I just couldn’t let it go so I went on a mission to figure out the rationale behind this design. The U.S. Mint website tells me it’s actually a bison skull that represents the state’s strong American Indian heritage (the Indians heavily relied on the bisons for centuries). So why not display a real bison, as in a live one? One only knows but if I were a Montana resident, I’d be asking myself the same question. At least, I’m not the only one who seems disturbed about this choice. 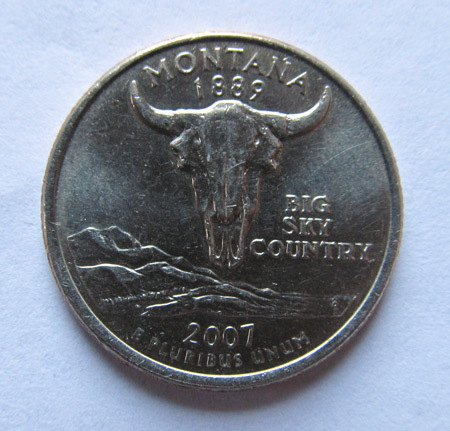 I found this other explanation on the Montana quarter online and the author doesn’t agree with the choice of a dead animal’s skull either, especially looking at it from out of state. What do you think about this? Do you like how your state quarter represent where you live? 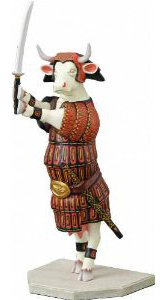 Previous Post Will somebody please mooove this cow? Next Post It’s another appearance from the Texas Longhorns! I don’t know what’s on the coins for all the states we’ve lived in. I’m guessing a palm tree for Florida, but I don’t know for sure. A floating disembodied head is okay, a skull is not. It’s just creepy. Let’s avoid any death symbols where money is involved. Thanks for sharing your opinion. Now I don’t feel it’s just me finding this choice disturbing. They clearly didn’t think about what people not familiar with Montana would think about a dead animal’s skull. The Texas one is just literally the state(shape) with a lone star over it because we are known as the “Lone Star State”….Not too surprised with that either….it’s a common theme here. I wanted the Golden Gate bridge and a surfer on a big Pacific ocean wave. Oh well, I’ve learned to live with our quarter by now.